Kesari Bhog is a very tasty variety of our very well known "Rosogolla". Kesar means Saffron, when the Paneer for Rosogolla is being prepared at that time Milk soaked saffron should be added to this. I had Kesari Bhog at my In-Laws place in Howrah. It was so yummy and melted in my mouth. But in USA it is difficult to get that Sweet. So I decided to make them myself. And here is the recipe. 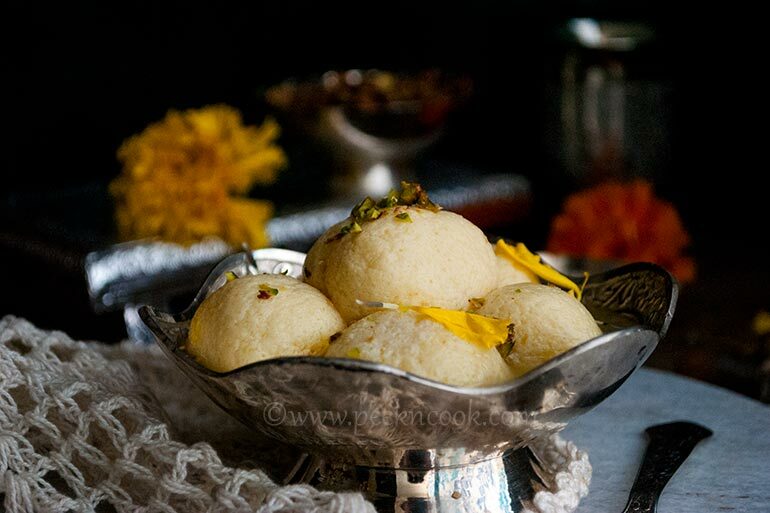 Kesari Bhog is a very tasty variety of our very well known "Rosogolla". Kesar means Saffron, when the Paneer for Rosogolla is being prepared at that time Milk soaked saffron should be added to this. Take a pan add little water in it and then add the milk, place the pan on oven and bring the milk to boil. When the milk will start boiling add vinegar + water to the milk. Do not add all the vinegar + water at a time. Add little by little and when all the vinegar + water will be added, turn off the oven and set aside the pan for 10 minutes for curdle all the milk (do not stir the milk after adding vinegar + water, the chhana will be harder). After 10 minutes take a cheese cloth on a large strainer and strain all the excess water of the chhana. Take the strainer under the tap and run cold water to remove the sourness of the chhana. Squeeze the cheese cloth to remove excess water and hang the cheese cloth from the kitchen tap along with the chhana to remove any excess water is left inside the chhana for 4-6 hours. Take a large mouth pan and add 1 1/2 cup of sugar and 4 1/2 cups of Sugar in it and add the cardamom pods and place on oven to boil the mixture. After 4-6 hours take the cheese cloth and squeeze to remove if any water was left inside the chhana. Now take a plate or bowl and mash the chhana with your palm. Mash the chhana to make it smooth for at least 15-20 minutes. Now add the Saffron soaked milk and add little at a time. Add few drops and mix with the Chhana. In this way add all the Saffron soaked milk to the Chhana and mix well. Now add the Semolina and 2 tablespoons of Sugar and mix again. Now start rubbing the Chhana with your Palm for 10 minutes. After 10 minutes make small balls from the Chhana dough. I made 12 balls from the dough, but if you want to make bigger size Kesari Bhog you can make little big balls. When the Sugar syrup will start boiling add the Chhana/Paneer balls to the Syrup and cover the Pan and boil for 10 minutes on medium heat. After 10 minutes open the lid , sprinkle some cold water and turn the Kesari Bhogs and cover again and boil for another 5 minutes. After 5 minutes turn off the oven and keep aside the pan to cool down. When they are cold enough place then inside the refrigerator and serve chilled. If you want little warm the Kesari Bhog and serve.